To enable the Power-Up, open the board menu on the right side of the page, select the Power-Ups menu option, and then click the "enable" button next to the Google Drive Power-Up. Once the Power-Up is enabled for the board, each individual user will need to authenticate their Google Drive account from within Trello. 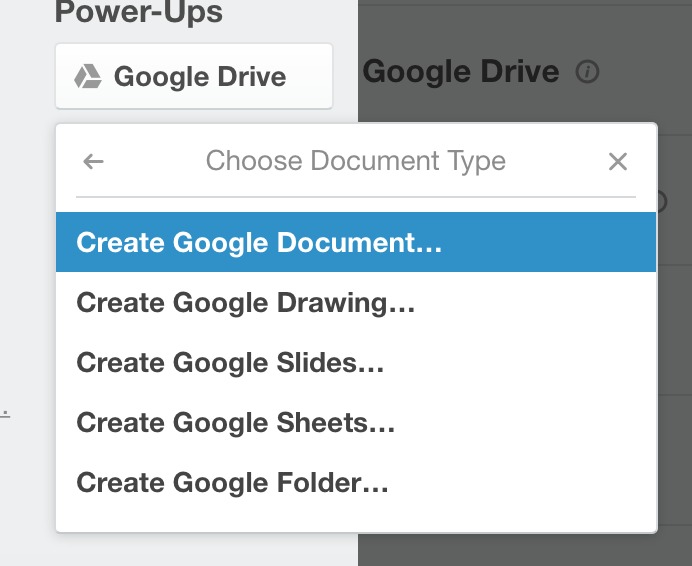 To do that, open up a card, click the Google Drive button in the Power-Ups section on the back of the board, and select "Attach a File," "Attach a Folder," or "Create and Attach." 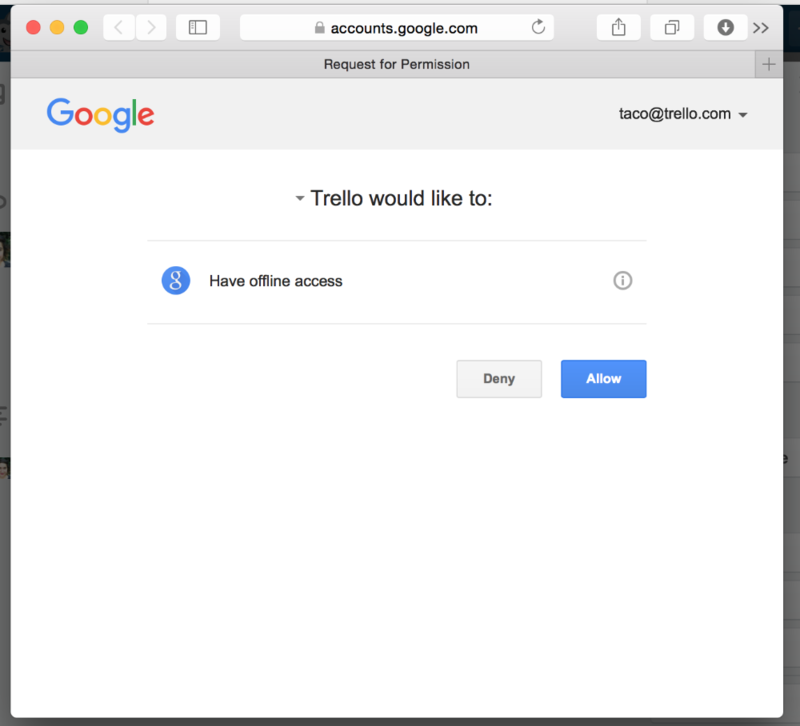 A popup window will open if your Google Drive account isn't already connected to Trello. Click "Link Google Drive Account." On the next screen, make sure the account you want to use is showing in the top right corner of the window. Then, click "Allow." You can access the Power-Up from the back of the card by clicking the Google Drive button in the Power-Up section. From there, select whether you want to attach a file or folder, or to create a Drive document and attach it to the card. If you choose to attach a file, you'll be given the option to navigate through Google Drive's files or folders and select the file or folder you want to attach. 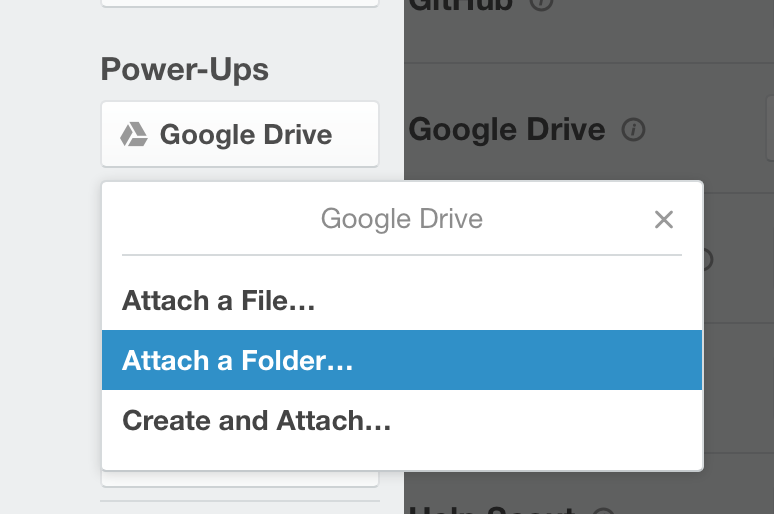 Attached files will look like attached files uploaded directly to Trello, with the option to open those files in Drive. If you attach a folder, you'll see a list of sub-folders on the back of the card, as well as links to any documents in that folder. 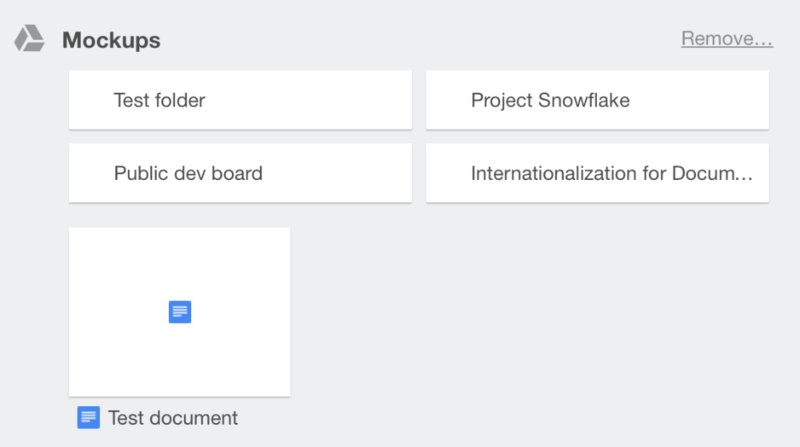 If you select the option to create a new document, you'll be given the option to select which kind of document. To remove a file or Folder, click the "remove" link next to the file or folder's name. To disable the authorization with your Google Drive account, open the Power-Up menu on the board. Click the gear icon next to the Power-Up, and click "Remove Personal settings." To disable the Power-Up for the board, open the Power-Up menu, click on the gear next to Google Drive, and click "Disable" next to the Google Drive Power-Up. Disabling the Power-Up will not cause any data loss. It will change the formatting of the links in the card to be the same as any other attached links.